Narrows alum Bettye LaVette continues taking the nation by storm--this time with an NPR "Tiny Desk" concert in which she completely reworks Ringo Starr's "It Don't Come Easy." Ms. LaVette has just released a CD of her interpretations of a variety of British rock songs. "Tiny Desk" concerts take place in the NPR offices, literally at a desk with minimal accompaniment. Ms. LaVette is backed only by an acoustic guitarist. See the brief concert by clicking here. Narrows alum, and fab hit songwriter, Darrell Scott has a new CD, a double set in which he reportedly plays all the instruments. If you're unfamiliar with him, learn more here. If memory serves he last played the Narrows about 5 years back, but was one of the first artists who played our beloved venue in the early years, teaming up with bluegrasser Tim O'Brien. By the way, in July Darrell will be touring in Robert Plant's band. The new release is called A Crooked Road, and you can read a review right here. Congrats and best wishes to a wonderful talent, brilliant songwriter and musician, and good guy. Narrows alum Bettye LaVette's new CD is now out. It's called "Interpretations: The British Rock Songbook." She covers The Beatles' "The Word," Paul McCartney's "Maybe I'm Amazed," George Harrison's "Isn't It a Pity," Ringo Starr's "It Don't Come Easy," Led Zep's "All My Love," and others. Congrats to a great lady! More info here. Valleys of Neptune--Jimi Hendrix--Not sure if there's a need for another Jimi Hendrix release--he kissed the sky 40 years back--but if there's going to be one, Valleys of Neptune is most worthy. A project of Janie Hendrix, Jimi's stepsister, and Experience Hendrix, Valleys of Neptune consists of recordings mostly made a year or so before his death in 1970, a time rock 'n' roll was becoming rock--the post-Sgt. Pepper era, when solos got long and guitarists became gods. Valleys of Neptune, for those who are more mainstream listeners, has alternative takes on familiar Hendrix work, such as "Stone Free" and "Red House" and a reading of Cream's "Sunshine of Your Love." But it's the groove, the feel that make this release special and remind all who care that this is where a lot of the jam bands, or more closely, stoner rock groups such as Kyuss, Fu Manchu and Monster Magnet or, to an extent, Queens of the Stone Age, got their mojo. The world has changed plenty since Jimi left us, but his music, forever frozen in the late 1960s, sounds like he could have recorded it yesterday. Some recent releases from artists who have played the Narrows, in addition to the much blogged Crooked Still release Some Strange Country. Release info from allmusic.com and other sources. Susan Cowsill--Interesting little story on this new release, Lighthouse, the 2nd solo from this daughter of Newport and the singing Cowsill family, and a particular fave at the Narrows, because she's a hugely talented singer and songwriter and too often gets overlooked. This release is on Threadhead Records out of New Orleans. The organization is less a record label, and more a vehicle by which New Orleans musicians affected by the great flood can fund recording projects. Susan has long been associated with New Orleans, and she lost a brother in the disaster. Mary Gauthier--She's a former Boston restaurant owner who sold the establishment as things picked up musically. That's only part of a backstory that no doubt informed her latest, The Foundling. Your humble blogger is particularly fond of her 2005 CD Mercy Now and suggests you check that one out too. BTW, she just played the Narrows in April. Crooked Still's O'Donovan: "We're Not Playing Bluegrass"
Crooked Still's leader Aoife O'Donovan talks about their new CD in an interview with No Depression. As you may know, Crooked Still is a Narrows fave roots group, playing our beloved venue from their earliest days. Find out why Crooked Still is not playing bluegrass here. The North Shore's Paula Cole--Grammy winner, hitmaker, Berkley-trained, Peter Gabriel protege, Dawson's Creek theme song writer, pianist--brought her passion to the Narrows Friday night for the first time. Backed simply by an acoustic guitarist and a drummer, her sound was nevertheless rich, empowered by her strong vocals and depth of emotion in every note. Still--she knew how to have a bit of fun too, rapping "Oh Mickey you're so fine, you're so fine you blow my mind, hey Mickey" over the rhythm lead into her late '90s smash "Where Have All the Cowboys Gone?" She closed the night out with an inspired version of Dolly Parton's "Jolene." The show was streamed live on mvyradio.com and should be in their archives soon. Jimmy Buffett's latest Buffett Hotel has a song from Jesse Winchester, coming to the Narrows June 11. It's called "Rhumba Man," and Buffett has some commentary about it on his website. "In my little corner of the universe, I am blessed with many wonderful comets which pass through my orbit. When it comes to songs and songwriters, it seems the region from which my melodic meteors arrive is just across the border in Canada, where when album creation time comes due, the words and melodies of Jesse Winchester and Bruce Cockburn come flashing my way. Fab local songstress, and very funny person, Cheryl Wheeler, returns October 8. We think of her as a local 'cause she lives a stone's throw from the Narrows, but as you probably know she's celebrated nationally and beyond. Jonathan Edwards also on deck in October. He lives on some island. The fabulous Holmes Brothers returned to the Narrows Friday night, in support of their cool new CD Feed My Soul. Wendell Holmes, left on guitar, seemed especially jazzed, perhaps because of his success battling cancer. Can't remember his playing the guitar so energetically! It was soul, gospel, rock, even a bit of country. These guys do it all, with God-fearing harmonies too. Can you imagine turning the Beatles' "And I Love Her," and "I'll Be Back" into soul? The Holmes Brothers did Friday night. Just added: Richard Thompson, August 29. Tickets are already moving. More info at www.ncfta.org. Narrows alum Josh Ritter--horsing around with fans at the Narrows in 2006 (photo left)--has a new CD out. It's called So Runs the World Away, and for a Paste Magazine review, click here. Jim Lauderdale's Got Another New One! Our guy, Grammy winner Jim Lauderdale, has a new CD, Patchwork River. It hits the streets Tuesday, May 11. Jim collaborates with legendary Grateful Dead lyricist Robert Hunter on this one. 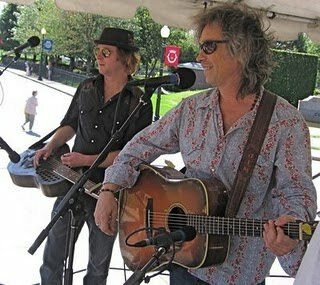 As you may know, Jim has performed at the Narrows several times, including playing at the Narrows Festival of the Arts. A good guy, well liked at the Narrows. By the way, he seems to pop up on television every now and then backing Elvis Costello or Willie Nelson. This past week he was on Letterman and "The View" with Willie. What can you say? Little Feat at the Narrows on a mild Friday night in May. Does it get any better? One of the most exciting young roots groups you'll hear, Crooked Still, has a new album out May 18th. It's called Some Strange Country, and features special guests Ricky Skaggs and Narrows alum Tim O'Brien. The word is it will feature mostly traditional tunes, some originals and a cover. NPR will have a sneak preview starting May 10 at www.npr.org/firstlisten. Former guitarist for the Rolling Stones, Mick Taylor, was rushed to an area hospital shortly before tonight's show at the Narrows. Unofficial word is that he's suffering from pneumonia. Last year, his scheduled appearance at the Narrows was postponed--although that time well in advance-due to illness. We wish him the best and look forward to his complete recovery, as well as his performance at our fabled venue. Mick Taylor joined the Stones after Brian Jones' death in 1969 and remained with Mick Jagger, Keith Richards, Bill Wyman and Charlie Watts until the mid-1970s. That means his guitar is on the albums Sticky Fingers (featuring "Honky Tonk Women" and "Brown Sugar"), Exile on Main Street ("Tumbling Dice," "Sweet Virginia," "Happy"), Goat's Head Soup ("Angie,""Heartbreaker," "Star Star"), and It's Only Rock 'n' Roll (Title cut, a great cover of "Ain't Too Proud to Beg," and "Time Waits for No One"). Mick Taylor quit the Stones after It's Only Rock 'n' Roll for reasons that have never been clear. Speculation includes not getting along with Keith, issues about songwriting credit, the lifestyle of being a Rolling Stone, and a desire to have a solo career. He was replaced by the Faces' Ronnie Wood, who has been a Stone ever since. Courtesy of allmusic.com, we just learned that Narrows alum Livingston Taylor has a new CD. It's called Last Alaska Moon, and you can learn more here. Have You Heard? Get Some Churchin'! Here I Am--Marvin Sapp--At this writing, this recording is #27 on the Billboard Top 200 Albums Chart, a couple places south of a Taylor Swift CD and a few north of Rihanna. That's right. Not the gospel chart or some other religious list. The Billboard Top 200, where The Glee soundtrack is #1. Who is Marvin Sapp? He's Senior Pastor Marvin Sapp, of the Lighthouse Full Life Center Church in Grand Rapids, Michigan. He's a traditional gospel performer, but with modern beats and production values. For example, although he performs live on the recording there's a lot of electronic wizardry--including the flawless impeccably mixed sound of a backing choir that has to be the stuff of studio magic, as the singers flawlessly wrap themselves around the pastor. Still, that old-time gospel vibe survives. Sample lyric: "He saw the best in me, when everyone else around me could only see the worst in me..." Note: This is the second CD of his finding mainstream success, so this is no one-hit accident like the great Edwin Hawkins Singers' fabulous record, "Oh Happy Day," a big hit when the world was young. The World is a Thorn--Demon Hunter--This band from Washington State is best described as "metalcore," so it's not likely they'll be topping any charts soon. Still, this Christian group is regularly reviewed in some of the mainstream metal press, e.g. Revolver magazine, metalreview.com, and not totally marginalized because of their proselytizing (some metal sites, though, still do not write about them). This is loud, growling, and aggressive--a sound you might associate with the Infernal One rather than the pearly gates. But perhaps that's the point: devout Christians can be mosh pitting headbangers or whatever headbangers do. Sample lyric: "Won't bow to government, Won't trust in a failed system of self-fulfilling lust, Won't love a world where my God is mocked..." Demon Hunter will have to leave metalcore to experience the mainstream success of big hair metal band Stryper back in the 1980s, but, considering that in metal integrity is everything, that's unlikely. A gutsy group not afraid to take chances in their work for the Almighty.